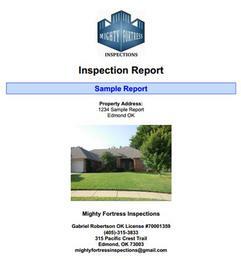 Our home inspection reports are very detailed, and include digital pictures highlighting any problems or features of interest. The table of contents page is clickable, allowing users to go directly to the page of interest. We also include a summary of recommended repairs and safety concerns. Buyers and their agents are given unique user names and passwords, so the reports can be viewed on any device with internet access. There is also an option to view and save the reports as pdf files, perfect for professionals who like to keep their files paperless! Most importantly, at Mighty Fortress Inspections, we believe that the relationship doesn't end just because the inspection has been completed. We are always available to answer questions or lingering concerns, and we can be contacted by text, email, or phone. Click on the image or here to see the sample report. The mold inspection reports are also very detailed, and complete with high quality digital pictures. The actual lab results with counts are included in the report, in addition to comments and recommendations. The length of the reports will depend on whether a complete or limited inspection is requested. A complete inspection includes the entire home. A minimum of two outdoor air samples and two indoor air samples are taken, plus two additional indoor air or tape samples. We also visually inspect the exterior and interior of the home for any issues relating to mold. When just a specific room or area is the primary concern, a limited inspection may be sufficient. This includes a minimum of two tape samples. We also visually inspect the interior and exterior of only the specified room. Click on the image or here to see a sample report.